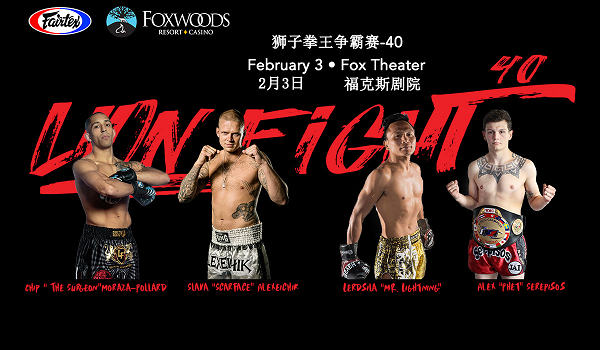 Live from Foxwoods Resort Casino in Connecticut, Lion Fight 40 opens their doors for another action packed night of Muay Thai fights including three championship bouts. In the main event of the night, the current Champ, and East Coasts own, Chip “The Sergeon” Pollard (6-0), takes on Auckland, New Zealand’s, Slava “Scarface” Alexeichik (30-8). The co main event consists of a world lightweight title fight between Alexi “Phet” Serepisos (40-10) and “Mr. Lightning” Lerdsila Phuket Top Team (194-31-5). The first of the three fights is a North American light heavyweight title fight with New York, New York’s, Elijah “The Mayor” (7-1) vs Brett “The Threat” Hlavacek (18-5).